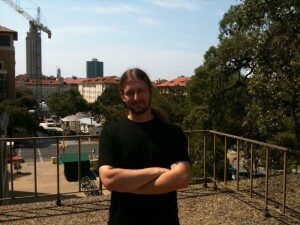 Dr. Derek Lackaff recently joined the project as a Postdoctoral Fellow in RTF at the University of Texas at Austin. He completed his doctorate in Communication at SUNY-Buffalo, where his work focused on social media, social network analysis and methodologies, and the social psychology of communication technology use. He is interested in crossdisciplinary approaches to new media research, and looks forward to helping the project develop collaborative research agendas. Derek also enjoys teaching and is a lecturer in RTF, where he is instructing the department’s Introduction to Digital Media course. Please contact him for assistance in developing your research programs and in identifying potential collaborators, and for consulting on projects addressing social media, network analysis, and quantitative methods. He will be instrumental in working with various Portuguese research teams on responses to the next call for proposals. You can get in touch with him to discuss you interests at Lackaff (at) mail.utexas.edu. This entry was posted in Networking and tagged postdoc, staff. Bookmark the permalink.